Click to edit a layout area. On the Blocks tab, drag and drop the Reference Content block to the area where you want it to display. 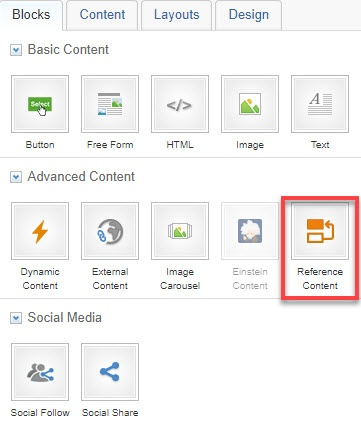 On the Content tab, in the "URL" text box, enter the complete URL of the content you want to embed. Immediately: The URL content will be retrieved at the time you select Immediately. This content can be edited. 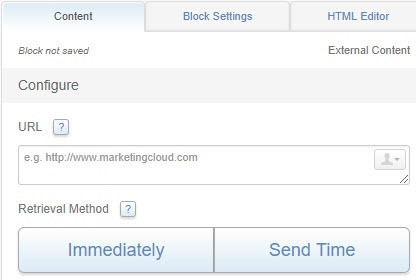 Send Time: The URL content will be retrieved when the email is processed for sending. This content cannot be edited. On the Block Settings tab, add background, border, and spacing as desired. When finished, click Done Editing.